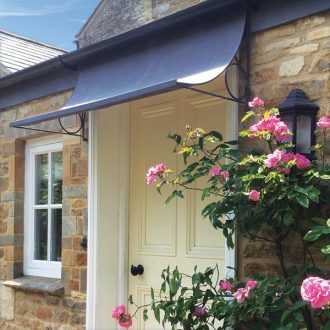 Protect yourself from bursts of April showers (or hail and sleet as we’ve had of late) with one of Garden Requisites’ Galvanized Steel Scoop Door Canopies. Our customer has added a gorgeous pink climbing rose, making a beautiful addition to an Aged Galvanized Scoop Canopy. Based in Bath, Somerset we manufacture our standard ranges of products in small batches or can design and make bespoke, one-off pieces.